Hennepin County officials on United’s St. Paul footsie: How about some sales tax money? You like that, right? [Hennepin County Commissioner Mike Opat] said Hennepin County’s soccer plan would seek to snare some of the 0.15 percent countywide sales tax collected to pay for Target Field. Bonds for the baseball park, which opened in 2010, are on track to be paid off about a decade early. Opat envisions the money being used for enhancements like streetscapes or plazas surrounding a new soccer stadium on a site near the Minneapolis Farmers Market. 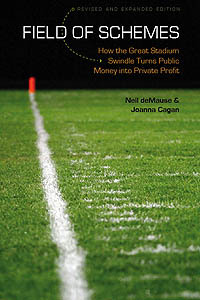 So instead of retiring the sales tax surcharge early, or directing it to something that would actually benefit Minnesota taxpayers instead of a private sports team, Opat is hoping to use it as a sweetener to get United principal owner Bill McGuire to place its stadium in Minneapolis instead of across the river in St. Paul. It’s not clear how much money this would amount to, and it would require not just a vote of the full county commission but approval by the state legislature as well, and it still doesn’t resolve the standoff between the team owners and Minneapolis Mayor Betsy Hodges over around $45 million in tax breaks for a soccer stadium. But it’s still a pretty sweet payoff for a couple of league press statements hinting that St. Paul might be an option. You have to hope that MLS commissioner Don Garber will get something extra nice in his Christmas card from McGuire this year. Minneapolis mayor to MLS team owner: You are too asking for a subsidy, quit pretending! Hennepin County has been backing Minnesota United since they franchise bidding vs. the Vikings, so I’m not surprised they are tossing some money their way. Small nitpick: Minneapolis and St. Paul are not just across the river from each other. They are about 10 miles apart on I-94. Smaller nitpick: Minneapolis and St. Paul are indeed next to each other (their downtowns may be 10 miles apart but I was just in a St. Paul neighborhood went across the river and was in Minneapolis) and much of their border is the Mississippi river. Not all of their border is the Mississippi as the U of M arena and stadium are on the east side of the river in Minneapolis. Just shows how powerful the sports-industrial complex and its lobbyists have become. They’ve replaced religion and trump everything–especially common sense. Opat pretty much built Target Field and I give credit to any guy who can spend public money for private profit like that. But when he wanted my new palace over there in his little sports colony, I pulled strings night and day and got it where I want it – next to the Star-Trib land that I bought and plan to develop. I’ve been hogging up city blocks near the site for a while now and that land will be like solid gold once my new tax-funded palace is in operation. I’ll be the mogul of the eastern end of downtown, ready to screw a few business partners just like I did back home, ha! Opat’s pretty smart but the payoff isn’t for MLS playing both sides of the river, it’s because Mike lost out on the NFL and pretty much just needs a project over there to keep his sports district dream alive, and boring old soccer will have to do now that I’ve got it all my way in the Taj Mahal biz. See ya round the farmer’s market, Mikey! Mpls is about 58 sq miles and St. Paul is about 55 sq miles, so the total of approx. 114 sq miles for the urban core of the two cities is not large for center cities for the population of the two together of approx. 700,000. The division brings some difficulties for policy and development issues: 2 central cities and 2 different counties, in contrast to other peer cities/areas (Denver, Seattle, Cleveland etc) of one city and one county. Plus, the city-city competition issue can play a big role, as the MLS situation here illustrates. (In addition to attempts by the counties to play a role) In Cleveland or Denver, the issue would be competing sites within the same government entity. Two downtowns that only 10 miles apart is another factor here. Hennepin County is a big county–more than 1 million residents, so they are the municpial heavyweight in MN politics.